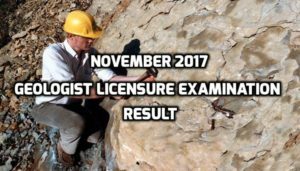 From the recently concluded November 2017 Geologist Licensure Board Exam held last November 14, the Professional Regulation Commission (PRC) already revealed the names of those who passed the board examination. As stated from the official website of the PRC, 453 applicants took the licensure in Manila and only 183 of them passed successfully. The commission’s Board of Geology administered the board examination headed by its chair Rolando E. Pena and assisted by two designated board members Benjamin S. Austria and Elmer B. Billedo. The PRC likewise stated that the registration for Professional Identification Cards (IDs) issuance and Certificate of Registration is set on November 28-29, 2017. The commission is advising all the passers to visit their official website online to check the guidelines and necessary requirements ahead of time. As for the oath taking ceremony, the PRC will provide updates about it soon.